Professor, Department of Endocrinology, Metabolism and Nephrology, Keio University, School of Medicine. Metabolism and Nephrology, Keio University School of Medicine. Professor Itoh and colleagues are focused on research and clinical activities on lifestyle-related diseases including obesity, diabetes, dyslipidemia, hypertension, and chronic kidney disease. 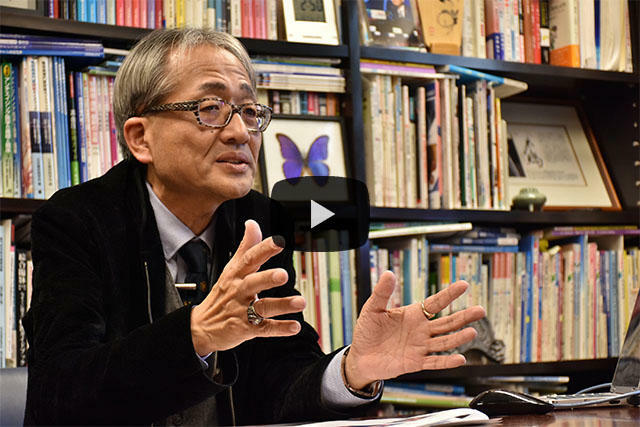 "We are looking at these diseases from the viewpoint of molecular or energy metabolism to elucidate their pathology and develop treatments," says Professor Itoh. Important findings include the discovery that diseases such as diabetes and hypertension are not one independent disease, but accumulate due to the increase of visceral fat in an individual over time. Professor Itoh refers to this concept as the 'metabolic domino'. Since metabolic domino is just due to the process of aging, the KGRI researchers refer to such metabolic syndrome or aging associated with metabolic domino as 'metabo-aging'. 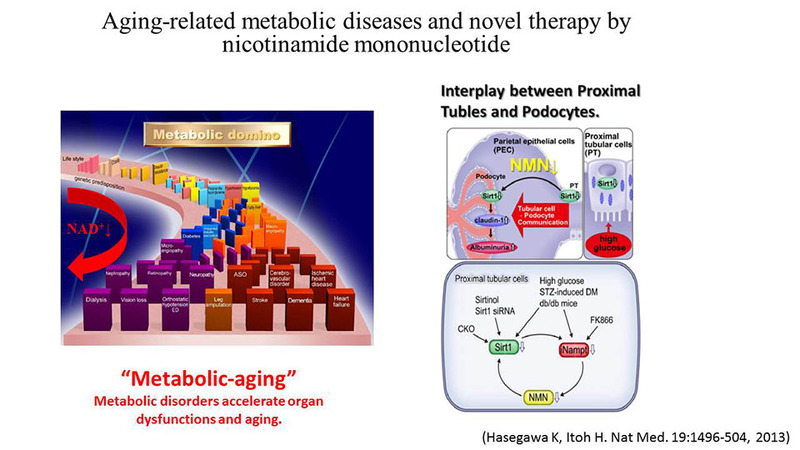 Importantly, a key substance of metabo-aging is NAD (nicotinamide adenine dinucleotide)--a sensor for energy metabolism. It is clear that the production of NAD in organs decreases in aging, obesity, and diabetes. The researchers expect that preventing this reduction of NAD will lead to the prevention and treatment of metabo-aging. Professor Itoh and collaborators discovered that the diabetic kidney disease is triggered by the decrease in the activity of sirtuin (a molecule that causes longevity by calory restriction), that leads to the decrease in the production of NMN (nicotinamide mononucleotide), which is a precursor of NAD. "Thus, we discovered that in the kidneys metabo-aging was the cause of organ failure and we showed the possibility of treatment of chronic kidney disease using NMN," says Professor Itoh. Furthermore, in 2016 researchers at the Washington University in St. Louis reported that oral administration of NMN prevented age-related diseases such as obesity, diabetes, and osteoporosis in animal experiments. So, on July in 2016 Professor Itoh's group started the first studies in the world on the oral administration of NMN in humans in collaboration with the Washington University in St. Louis, USA. After confirming the safety of NMN for humans the researchers want to develop treatments using NMN for obesity, diabetes, and chronic kidney diseases. So, they are investigating lifestyle-related diseases from the point of the metabolism of organs, and developing new treatment methods for these diseases. "I hope to continue this research in collaboration with people from all over the world," says Professor Itoh. Hiroshi Itoh, Professor, Department of Endocrinology, Metabolism and Nephrology, Keio University, School of Medicine. About one-third of diabetes patients suffer from renal failure. Therefore, understanding the mechanisms linking diabetes to renal damage (diabetic nephropathy) would benefit patients as it would help in developing new therapeutic targets and strategies. Sirtuin 1 (Sirt1) is a protein that is involved in cellular stress responses and has been implicated in diabetic nephropathy. However, the exact role of renal Sirt1 on the pathogenesis of renal damage in diabetes has not been fully elucidated. 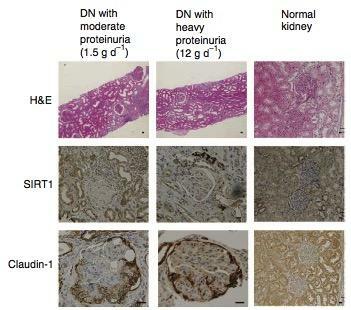 Researchers in Japan have previously shown that Sirt1 overexpression can alleviate acute kidney injury in a Sirt1-overexpressing mouse model. The same group has now established the mechanism that links, at least in part, Sirt1 with the pathogenesis of renal damage in diabetes. Shu Wakino and colleagues from Keio University, Shizuoka Red Cross Hospital and the Massachusetts Institute of Technology used Sirt1-overexpressing mice, Sirt1 knockout mice and diabetic mouse models to investigate the role of Sirt1 in protecting from diabetes-induced renal damage. Reduction of Sirt1 expression resulted in an increase in Claudin-1 levels and subsequently, albuminuria, which is an early marker of renal damage. The mechanism by which Sirt1 affects the levels of Claudin-1 was found to be through directly epigenetically regulating the expression of the Cldn1 gene. Furthermore, nicotinamide mononucleotide (NMN) was found to mediate the interplay between PTs and podocytes, which are important components of the kidney filtration apparatus, and hence would directly affect albuminuria. Using human renal biopsy samples, the group found that SIRT1 and Claudin-1 levels are also involved in diabetes-related albuminuria in humans. Taken together the results demonstrate that "Sirt1 in PTs protects against albuminuria in diabetes by maintaining NMN concentrations around glomeruli, thus influencing podocyte function," the authors conclude. Furthermore, since observations in patient samples reflect some of the mouse model results the authors state that "the results of this study could contribute to new therapeutic strategies to prevent diabetes-induced albuminuria." Authors: Kazuhiro Hasegawa1, Shu Wakino1, Petra Simic2, Yusuke Sakamaki3, Hitoshi Minakuchi1, Keiko Fujimura1, Kozi Hosoya1, Motoaki Komatsu1, Yuka Kaneko1, Takeshi Kanda1, Eiji Kubota3, Hirobumi Tokuyama1, Koichi Hayashi1, Leonard Guarente2 & Hiroshi Itoh1. Title: Renal tubular Sirt1 attenuates diabetic albuminuria by epigenetically suppressing Claudin-1 overexpression in podocytes. Department of Internal Medicine, School of Medicine, Keio University, Tokyo, Japan. Department of Biology, Massachusetts Institute of Technology, Cambridge, Massachusetts, USA.,. SIRT1 and Claudin-1 levels in kidney biopsies from patients with diabetic nephropathy (DN) and normal kidneys. The results show that SIRT1 levels in PTs and glomerular regions is lower, and Claudin-1 levels in the glomerular region is higher in patients with heavy protein urea compared to those with moderate protein urea.